Large ice machines that used to appear in restaurants and bars are now in homes. Companies that used to focus exclusively on commercial ice makers now are making them for homeowners as well. Scotsman is one of those companies, and the Brilliance Nugget ice maker is one of the products they’ve designed for use in homes. 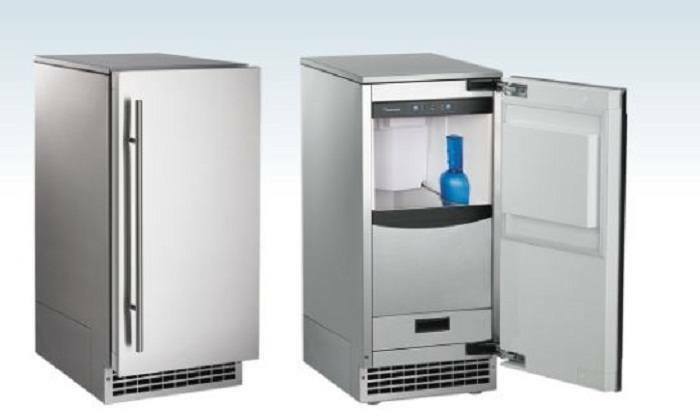 Its solid build, ease of use, high ice production capacity and excellent ice quality are why we’ve chosen it as the best standalone Sonic ice machine. If portable and mid-size sonic ice makers are too small for your needs, the Scotsman Brilliance nugget ice maker is perfect. 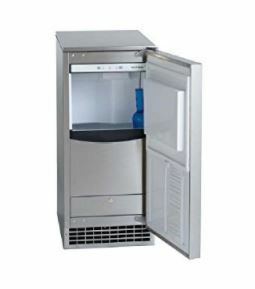 It is the gold standard for undercounter and standalone ice machines. It’s easy to use, allows you to customize its style and produces plenty of ice. And by plenty, I mean up to 80lbs of ice per day. So you can even use it in a small restaurant, office or venue. It produces the much beloved sonic ice. They are soft ice nuggets that crumble easily in your mouth and make for the perfect addition to a margarita, cocktail and many other sweet drinks. 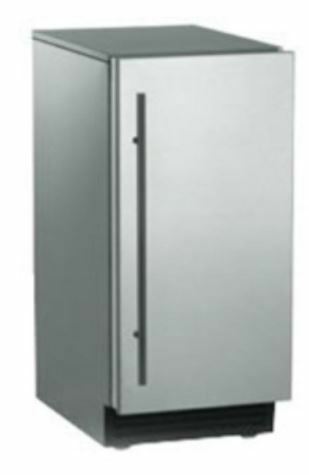 The Scotsman Brilliance can be used as an under-counter or standalone ice machine. If you are installing it under the counter take careful note of its dimensions (check the specs above) to make sure it will fit. For quick reference, it’s about 15” wide and 34” high. You can install your own custom panel and even reverse the door. This particular Scotsman Brilliance model comes with a built-in drain pump. It’s ideal if you don’t have a floor drain and the only place to drain the water in the sink. If you have a floor drain where water can flow on its own, get the Scotsman Brilliance SCN60GA-1SS gravity drain model. It’s around $500 cheaper but doesn’t contain an integrated drain pump. Regardless of the model, you get set up takes a while because you have to connect a water line as well as the drain hose. Most customers find it easier to hire a plumber to do the installation. Once you’ve set it up. It’s really easy to use. You can leave it to make ice continuously whenever you empty the ice bin or switch it on only when you need ice. The Scotsman Brilliance makes a lot of ice. In a span of 24 hours, it can make up to 80lbs of nugget ice. It can store a maximum of 26lbs in the ice bin. When the bin fills up, a sensor automatically stops production of ice. When you scoop some of the ice out, the machine starts making some more. So you basically have an endless supply of ice. But note that the ice machine cannot store ice forever; it is not a refrigerator. If you don’t use it up quickly, the ice will start melting. This is no problem although it could lead to increased water usage. The bin is well insulated and can keep one batch of nugget ice for around a week before it all melts. If you want to keep it longer than that, I suggest storing the ice in the freezer. One other thing to note is that the production capacity can change depending on the temperature of the surrounding environment. If you install the machine outdoors, put it in a cool, shaded place. 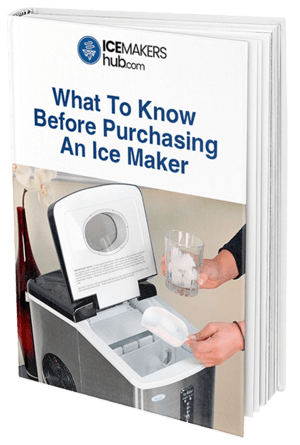 The quality of ice the machine produces will mostly depend on the type of water you use. Make sure the water is clean and portable. Avoid using hard water. The minerals can build upscale inside the machine and affects its operation and also reduce its lifespan. Scotsman recommends installing a filter in the waterline to filter out any minerals and particles that could affect the ice quality. The manual also warns against using deionized water. It could damage the machine. As long as you use clean, water, you'll get soft chewable ice in the bin. It has the same texture as Sonic ice, making it perfect for crunching. It’s also great for margaritas, fruit juices, cocktails, iced tea and many other drinks. The ice comes out in one shape and size. But because of melting, you may find differently sized nuggets when you go to scoop the ice. The only bit of work is in installing the machine. To save time, I recommend getting a plumber to do it. But you can also do it yourself; it takes about an hour. You’ll need to set up the drainage and then hook up the water line and install a filter if necessary. Then plug it in, and you are good to go. The control panel is visible when you open the door. It consists of three indicators for when the unit is in operation, when there is no water coming in and when you need to clean the group. There are also two buttons for on/off and CLEAN. Regarding maintenance, you only need to clean the machine twice a year. Clean it more often if you use hard water. Check the manual for instructions on cleaning and also how to prepare the machine for storage during winter. The Scotsman Brilliance has mostly positive customer reviews. Customers love the amount of ice it makes, how soft and chewable it is and how easy it is to use the machine. Those who have owned it for years have not experienced any significant problem. The only (minor) complaint is that the ice maker can get a bit loud when the ice is falling into the bin. Otherwise, it works very quietly. At almost $4,000, this is one of the most expensive ice machines. But the investment is worth it. It will give you years of excellent service and an endless supply of delicious Sonic ice. But if you think it’s too big or too expensive, see our smaller and cheaper recommendations. If you are looking for the best undercounter sonic ice maker, you can’t go wrong with the Scotsman Brilliance. It’s pricey, but it quickly proves its worth.A great buy for families that can’t live without Sonic ice.